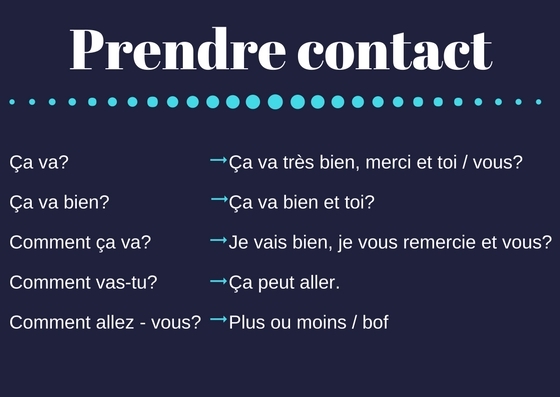 A few months ago, we shared with you some basic phrases that you should know if you decide to learn French or spend a few days of holidays in France. But we know that to communicate better, you will want to know how to introduce yourselves to your new acquaintances as if you were natives. Therefore, we have decided to leave you an easy guide to greet, interact and say goodbye without any problem. It is good to know that in France, manners and basic rules of courtesy are of great importance. It will be very rare for you to pass by someone’s side without greeting them, it does not matter if you are acquaintances or not. It will never be too much to say “bonjour” or “bonsoir”, so do not be afraid to say hello at any time. Before getting into content, it is good to tell you that the great importance of speaking the language accordingly lies in knowing how to communicate in the right way. When we are in the process of learning, we must know that French is divided between formal and familiar language. There are different words and even basic rules that differentiate each style. In general, we use formal language to address people we do not know, elderly people, or in the work environment, and one of the biggest differences lies in the use of “vous”. On the other hand, we use “tu” in the informal language which is to communicate with close people, friends or family. As we mentioned at the beginning, a greeting is of great importance in France. If you go down the street and you run into someone, if you get on the bus, or enter a bakery, the most normal thing is to say “bonjour”, even if you do not know anyone in the place. 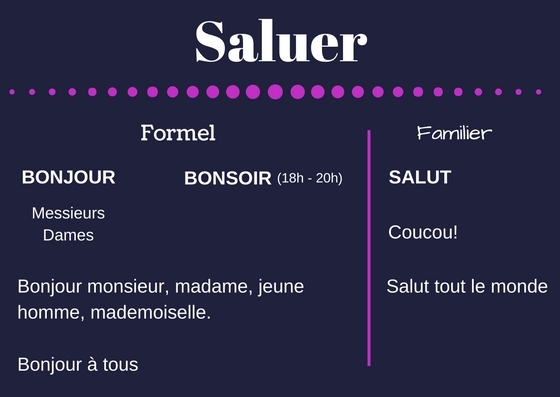 If you want to be more formal, just add a title to each person or, on the contrary, if you already have confidence, the first thing that will come to your mind will be “salut”. Break the ice and start talking can be a challenge when you’re in a new place, more if you’re speaking a different language. So, a couple of phrases to start a conversation are never too much on our list. Remember that, when you talk to another person, differentiating whether you are speaking in a formal or informal tone, will be mainly given by the use of “vous” or “tu”. 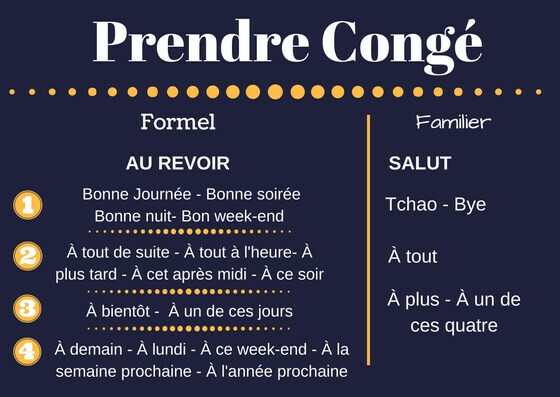 Although “au revoir” is the most common word known worldwide to say goodbye in French, there are a few phrases that can make you sound like a local when you leave a place. They are used depending on the moment and the context. #1 we use them to wish a good day or to say “I hope your day goes very well”. #3 if we are not sure when we will see each other again, we use some of the phrases from the third group. #4 we are sure of when we will meet again, that‘s why we specify at the end of the sentence the day or precise moment of meeting. #2 when we say goodbye but we’ll see each other again sometime during the day, we use the phrases of the second group. We use “À tout de suite” if we’ll see each other in a short time, usually in less than an hour; if we meet again in more than one hour we can use “à tout à l’heure”; and if it will be a long time, we better say goodbye with “à plus tard”. Go from basic level to fluent French.